Frequency Intelligent Valvetronic Exhaust System technology offers cutting-edge intelligent ECU exhaust control valve, with an emphasis on the optimization of both acoustics and performance. 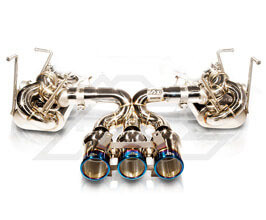 When the valves are fully open for maximum flow and power, it creates an exotic tone and allows for high performance. When the valves are closed, volume is reduced for a more low-profile comfortable drive. With the latest technology, just one click on the remote control will setup any rpm to automatic mode. The automatic mode enables the system to detect the engine RPM to intelligently switch comfort/racing exhaust profiles. Users can also opt to simply switch valve on/off mode as desired by remote control when driving. Triple tip outlet. Compatible with stock cat pipe.